Millions of people across the globe held their breath earlier this year when 42-year-old American skydiver Luke Aikins jumped out of a plane 7,620 meters (25,000 ft) above Simi Valley, California and landed in a 30.5-by-30.5-meter (100-by-100 ft ) net below… without a parachute. It’s not something any of Cambodia’s elite airborne Brigade 911 are recommended to try and mimic too soon though after six of its eight member precision paratroop team failed to land inside the 332-by-201 metre (1,048-by-659ft) opening of Phnom Penh’s National Olympic Stadium during the week. After leaping out of a helicopter from a much lower altitude to rehearse a spectacular opening for the first Cambodia National Games on Saturday, the ‘highly trained’ military squad became the spectacle themselves when they landed among Phnom Penh peak hour traffic. Thankfully the appalling condition of Phnom Penh roads, plus the constant traffic snarls and regular, random, periodical gridlock caused by Khmer driving habits and zero attempt at traffic control meant that none of the Cambodia paratroopers were struck by moving vehicles; though one was left dangling embarrassingly from a street light pole. 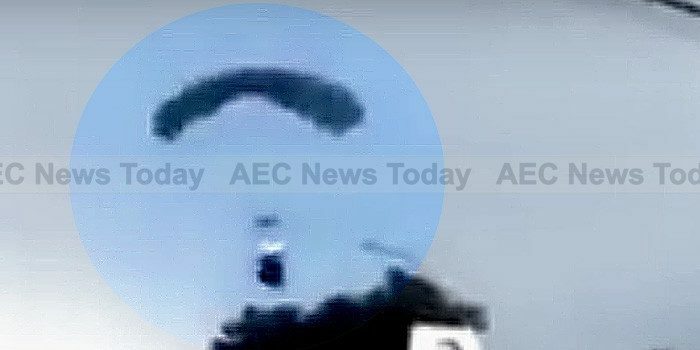 The Phnom Penh Post reported a security guard at the scene as hearing one of the paratroopers blame the botched landing on ‘strong winds at high altitude and weak winds at lower altitudes’, while The Cambodia Daily quoted Chap Pheakdey, commander of Brigade 911 as blaming it on ‘“technical errors”‘. Not suffering any embarrassment over the incident Brigade 911 will be back again on Saturday to try again for what is being billed domestically as the largest sporting event since the 1960s. The Cambodia National Games will see amateur athletes from across the country compete in a range of events through until November 5, with the organisation being billed as a dry-run for 2023 when Cambodia will host the SEA Games. Originally built to host the 1963 Southeast Asian Peninsular Games (Seap), which were cancelled due to political problems in Cambodia, Phnom Penh’s National Olympic Stadium was an execution site under the Khmer Rouge. For the 2023 SEA Games a new stadium, the Morodok Techo National Sports Complex, is under construction in another part of Phnom Penh.